German company Mercedes-Benz came up with a sketch and short video clip showing the upcoming Mercedes-Benz GLE sport utility vehicle’s redesigned front fascia and exciting new set of LED headlights. As if the GLE has not been talked about a lot lately, now the sketch and teaser video turned people’s enthusiasm to a near obsession. The new-generation Mercedes-Benz GLE will be based on the MHA RWD platform. The silhouette of the car might remain the same, but the styling on the new GLE is bolder and definitely more futuristic. It is longer, too, at 3.1 inches (80 millimeters). Spy shots revealed a prominent new grille, sweptback LED headlamps, and wraparound taillights. The new model is less boxy, too, and has sharper-looking bumpers, larger alloy wheels, and the familiar twin exhausts. The 2019 Mercedes-Benz GLE will most likely use the 4.0-liter bi-turbo V8 engine on the GLE 63 which will be available in two flavors—one that makes 563 horsepower and another one that produces a whopping 604 horsepower. 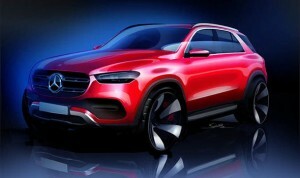 We also believe that the German carmaker will introduce an entry-level GLE 53 AMG to the SUV’s lineup. This will use a 3.0-liter in-line six-cylinder engine. For the standard versions, Mercedes will use a number of four- and six-cylinder petrol and diesel engines for the 2019 GLE. These engines will be paired with a 9-speed automatic gearbox. There might also be a 48-volt plug-in hybrid version that’s going to be paired with the six-cylinder versions. Spy shots revealed an interesting take on the interior, especially because of the new technology that Mercedes has been working on. In terms of in-car tech, Mercedes is doing a complete revamp. It will now come with twin 10.25-inch display units for the instrumental console. The center console, on the other hand, will run the MBUX (Mercedes-Benz User Experience) interface. The new SUV will also arrive with a three-spoke steering wheel, grab handles integrated into the central tunnel and powered seat adjustments for the rear passengers.